While I continue to believe that Apple makes great laptops and love the performance of my 2018 Macbook Pro, I also want to be as transparent as possible and note that I have had a string of quality problems with this particular computer. In my previous ~10 years of using Apple computers, I have never had a problem. But this particular laptop has been very frustrating. It started with a series of black screens – ie, the computer would not power on at all (just some fan noise). I had it replaced, and the problem came back a few months later. I had it replace again, and the problem came back again. Additionally, I experienced 2 episodes where half the LED backlight were disabled, resulting in a dark screen. Rebooting the computer was a quick fix for that, but the ongoing problems with the computer failing to boot (ultimately worsening until the computer would not power on at all) were far more serious. This meant the computer was out of use for a week while it went to Texas and back for repair. And because the T2 chip ties the security of the hard drive to a specific motherboard, each repair meant the drive was wiped clean. After the 2nd failure, Apple agreed to a complete replacement of the computer. Hopefully, this new laptop will perform as well as my previous Apple laptops have. I’ve learned a LOT from that experience. I had to restore my data from a clone backup 5 times in the past 5 months (2 repairs, 2 temporary computers while my laptop was in for repair, and a final replacement). If you haven’t already, be sure to see my tutorials on how to backup, recover from a crash, and backup drives I recommend to help make sure your data is protected and that you may get back to work as quickly as possible if something does go wrong. Why upgrade a 2-year old Macbook Pro? My laptop is the single most important part of my business, it touches everything I do – image editing, software development, travel planning, my website, etc. I put a lot of value on speed improvements. That said, I debated this purchase a bit. First, Apple computers are not cheap (though that cost offset was significantly by the high resale value of my old laptop, as well as tax deductions for a business expense for the amount the new computer costs over the resale of the old one). There’s no doubt I could get same or better performance for less money with a Windows machine, I’m very comfortable with them having built them myself for years, and Windows 10 eliminates my old hangups about Windows quality. But I just prefer Macs now after years of use, and I have a fair bit of Mac-specific software (including scripts I’ve written to package and update Lumenzia). So an Apple laptop is still worth paying a premium to me (though I’d probably recommend Windows machines for any photographer looking for the best performance/cost ratio). Secondly, I had some concerns about potentially reduction in battery life with the new RAM used to support 32GB. Apple previously stated that battery life would take a hit with the type of RAM they’ve put into the 2018 MacBook Pro, but they’re now saying that the battery capacity was increased enough to offset that issue. That raised questions for me, but I was still willing to give it a try (knowing that I could return the laptop if it didn’t perform as expected). In reviewing the benchmarks I’ve seen on the CPUs and system performance for the 2016 and 2018 laptops, I was expecting about a 30% increase in speed, which means a 25% reduction in the time it would take to complete a given task. I generally feel that a 20% difference is required to be noticeable, so this isn’t much above my threshold. But I wasn’t too sure what I’d really see. Photoshop isn’t generally optimized for multi-core performance and this laptop improves speed in multiple ways (CPU, RAM speed, 32GB of RAM to avoid using the SSD disk for memory, SSD speed, and a modestly improved GPU). Ultimately, I decided that the performance gains would likely be worth the investment, and I’d have a few weeks to test things out and return it if I was wrong. So I put the new laptop through it’s paces when it arrived. Both of these machines are the maximum specification you can by in their respective year. Old laptop: 2016 with a 2.9GHz Core i7 CPU, 16GB of LPDDR3 RAM, and 2TB SSD. New laptop: 2018 with a 2.9GHz Core i9 CPU, 32GB of DDR4 RAM, and 4TB SSD (yeah, I’m that guy who sprung for that insane SSD – I’ve already got 8TB of working data and want to take more of it with me). I was particularly interested in the jump to 32GB of RAM. Even when I close everything but Photoshop, my files are complex enough that my computer is routinely using the internal drive as virtual RAM. That creates a potentially significant speed penalty. The better CPU should of course benefit performance, but there is no reason to think the larger SSD would outperform any of the smaller (and much less expensive) options. Computer reviews always seem to have these fun benchmark numbers that are somewhat meaningless to me. I get the numbers, but they don’t really tell me much about how the computer will perform for what I need. For example, I trust that new laptops get 10 hours of battery life for surfing the web or even watching some videos. But when you are creating videos like I am, that can easily mean the battery is completely drained in less than 2. So I thought I’d share my own personal test results with typical photography work. This isn’t a rigorous scientific test, but I’ve been truly impressed with the performance I’ve seen. The numbers below are based on head to head tests with everything kept as similar as possible. I ran the new machine on a clone of the old one and worked from same apps and images. The test numbers are based on the average of 1 to 3 samples for any given test. ~75% faster write, going from roughly 1500 to 2700 MB/s (about a 43% reduction in time to complete a theoretical task). It’s hard to be too specific about the speed, as Black Magic doesn’t offer an average test run and the 2016 performance varies a bit from run to run. Needless to say, the 2018 is clearly faster and is by far the fastest disk I have ever seen. I was truly stunned by these results. Everything I do for photography seems to involved about 30-90% less waiting. These are huge differences that will truly save me a lot of time. I was shocked at how much faster Nik and Smart Sharpen are in particular. I was also surprised by the video performance, but by how it improved less than my Photoshop work. It is clearly a valuable jump, but I though I’d see the most gains here given videos apps are generally better optimized for multi-core work and the 2018 has 6 cores vs 4 in the 2016. As I spend more time creating photos than videos, I’ve very happy with the overall performance. I can’t say how much each component added to performance (since I don’t have other configurations to test or test methods that would more clearly differentiate). The CPU certainly matters. 32GB should matter (though I tested under heavy RAM loads, I did not yet encounter performance hits on the 16GB machine). I would expect the SSD size does not (I haven’t read anything about different controllers or performance). If I were buying this with a tighter budget, my priorities would be (in order): (1) screen size (unless routinely using an external monitor), (2) SSD size sufficient to allow recent work to run off the internal drive (probably 1TB), (3) faster CPU, and then (4) the 32GB RAM option. The SSD is very helpful for opening and saving files (it runs about 58-77X faster than an external spinning drive, and nearly 7X faster than my external Thunderbolt SSD). My recommendation for the CPU here is that it offers a 31% boost in base clock speed, while the 32GB RAM would only boost speed under heavy load and I wasn’t yet running into that under relatively heavy conditions (simultaneously opened Firefox, iTunes, LR and PS with a large layered file). At some point, the increased RAM will certainly matter. If you do a lot of panos or other memory-intensive work, 32GB of RAM may be a higher priority. I don’t know if the video card upgrade is really meaningful for Photographers (I suspect potentially for creating video), but it’s a smaller incremental cost if you want to go for it. The theoretical advantage of having more RAM (32 vs 16GB) is that the computer’s performance does not degrade as you work on larger files or otherwise use more memory. To get a feel for things, I tried testing stripped down (just running Photoshop with the single layer test file described above), vs with a large file in Photoshop, vs with other apps running (iTunes, Lightroom, and Firefox). I was very surprised at how well OSX manages 16GB of RAM. Whether memory compression or other techniques, I found that the 16GB machine did not slow down much until I started to really use abnormally large amounts of RAM (beyond what I would normally do). I tried using Photoshop’s Image Resize (Preserve Details 2) to enlarge the same D810 image by 10X horizontally and vertically (which Photoshop estimated would create a 23GB image). This took 95.2s in the 2018 vs 204 in the 2016 (a 53% reduction in time). So clearly, the performance gap has started to widen from the 40% benefit I saw above, but this is also a file size (and certainly resolution) well beyond what I normally use. I then tried using the same resizing to take that D810 image to 100,000 x 66,739 pixels (which Photoshop estimated would create a 37GB image). This took 165 vs 904s (an 82% reduction). So clearly, the gap has widened at this point and suggests that the extra RAM is important (but this scenario is well beyond any foreseeable use I have for Photoshop). This is a fairly simple test, so I also tested a file with enormous numbers of layers (closer to my normal use case). I did not record the numbers from that testing, but did not see the 2018’s performance benefit grow significantly even when testing files that had far more layers than I typically use. That’s not the result I expected, but that’s why it is important to test things yourself and not just rely on theoretical benefits. Bottom line, 32GB of RAM matters, but nearly as much as I expected. Kudos to Apple and Adobe, they seem to manage limited memory better than I assumed. Unless you are doing serious panos or other work with very large files (probably 8-10GB files or larger PSB files, which is unusual), I’d recommend upgrading the CPU before the RAM. The CPU will benefit nearly any work you do, where the RAM upgrade will only create a benefit under certain conditions. The speakers are better, which is impressive given how much the 2016 speakers blew me away. The T2 chip should offer some extra security (I don’t really use Siri much, so I don’t know that I’ll benefit from that part of the upgrade). Bluetooth 5 may turn out to be something I appreciate down the road, I’m not really sure. My initial experience with the battery seems very similar to the 2016. That may actually mean an improvement of sorts given how much more work I can do in “10 hours”. In other words, I would bet that when Photoshop needs 15s vs 4+ minutes to do Smart Sharpen, there’s probably more battery power used while I’m waiting. At a minimum, it seems my fears about battery life potentially being impacted have not materialized. 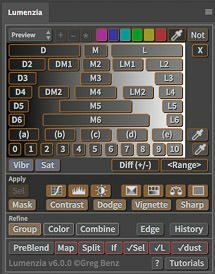 Note that photographers should turn off the new “true tone” display option in system settings – this runs counter to proper color management. Any computer upgrade is a big expense, especially a Mac, but I’ve been truly impressed with the performance improvements compared to a laptop that is only 2 years old. The performance is the whole story here, there aren’t any other updates I’d really call very notable (and no compelling reason for PC users to take a second look for this update). If you’re willing to invest to get the best or are coming from an older Mac, this is a very nice laptop for photography that’s definitely worth a closer look. The 4TB SSD is definitely overkill for most users, but getting the 1 or 2TB SSD to be able to edit your latest photos from the internal drive is definitely worth considering for the speed boost. The 32GB of RAM is a particularly nice option and highly recommended for photographers working on complex layered images. Without a doubt, this is the fastest I’ve ever used. Disclosure: This article contains affiliate links. See my ethics statement for more information.